Couldn’t you just do that in Photoshop? During the last workshop that was the running theme. The conversations varied from whether it was appropriate to add a moon to a scene to “I don’t use filters because I can do everything in Photoshop.” I suppose that’s correct to a certain degree but there’s one filter that Photoshop will never remove from my bag; the polarizer. Adding the moon? I won’t go there. I’m often surprised to see folks, shooting landscape images, who either eschew or ignore something I consider to be essential. Regardless of your skill, a properly adjusted polarizing filter has no Photoshop analog. Oddly enough those same folks who would never think of using a polarizer often insist on having a, useless, UV filter on their lens at all times. I like to consider the end result when considering any filter or technique; if it’s not making a positive change I won’t bother. In the case of the UV filter, they increase lens flare and cheaper ones actually degrade overall image quality. I believe people come to use them largely because of camera store fear-mongering. If you drop the lens off of a truck, that UV filter isn’t going to save it. Concerned about your front lens element? Use your lens cap. This shot wouldn’t have been possible without a polarizer. Most people just think about their effect on blue skies, not what really makes them tick: reflections. The ability to increase or negate the impact of reflected light can make or break an image. In the case of foliage, removing surface reflections makes colors really pop; no saturation slider required. In the case of this image, I was able to completely remove the reflection from the surface of this ice. Without the filter, the leaf was completely obscured. Because the polarizer is adjustable, I was able to bring back just enough reflected light to let you see the texture on the ice while letting the leaf shine through. Got a polarizer collecting dust in your bag? If the answer is yes, throw away that UV filter and start using the polarizer. Don’t be content to just screw it on your lens, check and adjust it on every shot. You’ll be glad you took the time. This entry was posted in Photography and tagged bridal veil, Canon 100-400, Canon 7D, doug otto, ice, leaves, Photography, yosemite, yosemite national park. Bookmark the permalink. I really like this image. Just the perfect touch with the polarizer there. 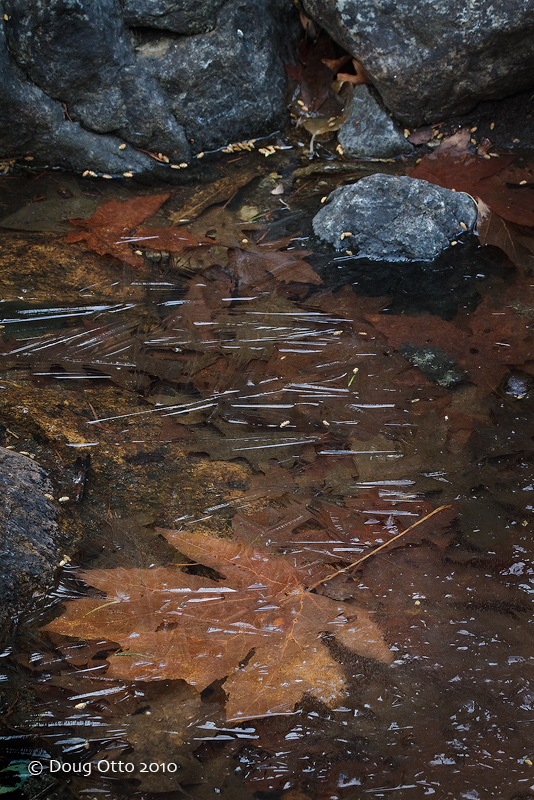 I was looking the last time for specifically this type of shot; fall leaf, covered under thin ice. It’s not at all easy to find, like it may seem it is. I also concur 1,000% about the UV filter. Whenever you can avoid adding more glass on top of your lens glass, then do it. Not only does the lens cap protect the front element, but the lens hood is really what saves you. Don’t tell anyone, but I rarely use a lens hood either. I do keep a constant watch for flare and will shade the lens if necessary. They make using a polarizer a real hassle.